Itching to go on vacation, but don’t know where? One way to narrow down your choice of destination is to figure out which places are easy to travel to – and this new site can help. 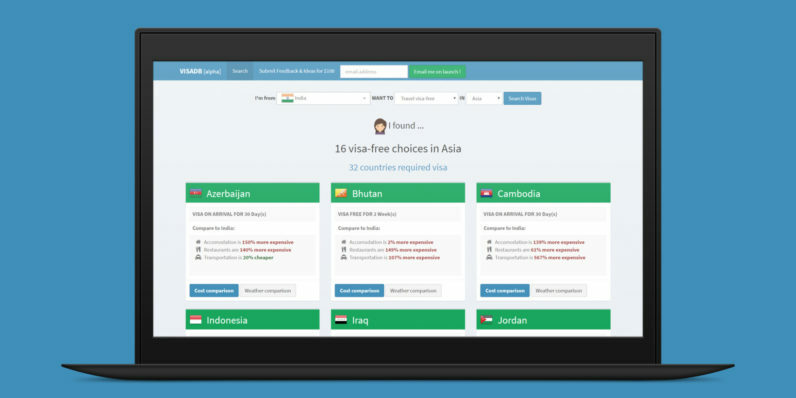 Tell VisaDB where you’re from and it’ll list all the countries you can travel to without having to apply for a visa. It specifies how long you can stay, whether you can get a visa on arrival, and displays a comparison of accommodation, transport and food costs between your home and destination countries. You can also look up countries that make it easy to launch a startup; there are plans to eventually add information about which places will let you live, work, study or seek citizenship easily. The site is currently in alpha and its data is scraped manually from government sites and third-party sources, so it might be worth double-checking with national embassies’ sites once you’ve narrowed down your options – just to be sure. But it’s still an excellent tool for figuring out where you can go without all the hassle of visa paperwork.